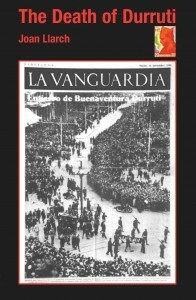 Durruti, Ascaso and ‘Combina’ were arrested on Sunday 2 April 1933 as they left the Andalusia-Extremadura Regional Congress. The grounds offered for this action by the police were as follows: they were “to answer for the criminal notions they had voiced at the closing rally”, which is to say, a thought crime and this was a breach of the most fundamental freedom of personal expression. The Death of Durruti by Joan Llarch (translated by Raymond Batkin); 174pp, 230mm x 152mm, photos/illustrations, bibliography and index, £9.95 (p+p UK £1.80; Europe £4.50; US/Canada £7.00). ISBN 978-1-873976-61-6 READ INSIDE!